Space Shuttle Atlantis carried a special payload during its STS-34 mission. Commander Don Williams and crew transported the Galileo spacecraft into Earth orbit, from which point it was launched on a years-long voyage to Jupiter. Galileo would become the first spacecraft to orbit an outer planet and would go on to reveal fascinating views of the gas giant and its moons, as well as make monumental discoveries about the nature of the Jovian system. Primary Mission: October ’89 to December ’97. Extended Missions: 3, from ’97 to ’03. Work on the Galileo craft began in 1977, after the exploration of Jupiter was listed as the number one priority in the Planetary Science Decadal Survey published in 1968. Fly-bys of the massive planet were conducted by the twin Pioneer 10 and 11 and Voyager 1 and 2 spacecrafts, but Galileo was set to do more than just perform a fly-by. It would launch an instrument-laden probe into Jupiter’s atmosphere, and then continue to orbit the planet for years. This mission would provide knowledge of the Jupiter system that could hardly even be imagined. Galileo suffered a number of postponements. The first planned launch was to be from Space Shuttle Columbia in 1982, but development delays in the Space Shuttle program made that early of a launch unfeasible. The upside is that this gave the Galileo developers more time to work on the probe. Further planned launches and postponements occurred in 1984, 1985, and 1986. As we all know, 1986 was the year of the Challenger disaster. Galileo would be put on hold during the 32-month hiatus that followed the tragedy, as every detail of the Shuttle program was examined and made safer. 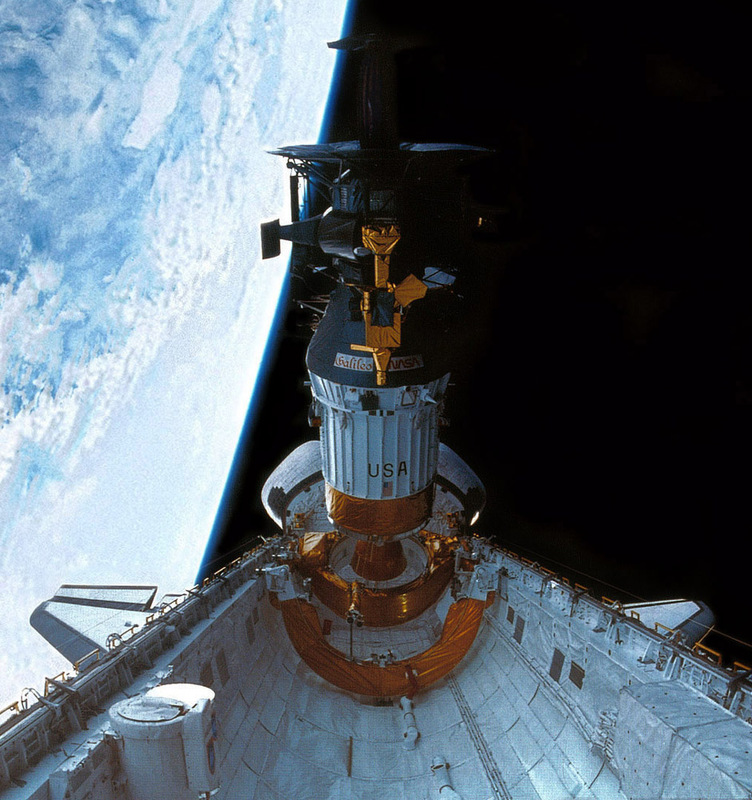 Galileo was originally planned to be attached to a liquid hydrogen-fueled Centaur-G booster; however, new safety protocols following Challenger prohibited the booster from being carried in the Space Shuttle’s payload bay. Mission designers had to reconsider how they would get Galileo from the Shuttle’s low Earth orbit to Jupiter. They decided on employing a solid-fuel Inertial Upper Stage booster (IUS). Whereas the Centaur-G would have propelled Galileo on a short and direct trajectory to Jupiter, the IUS would take longer and also require some technical gravitational slingshot maneuvers to make it to the gas giant. Galileo was finally launched from Space Shuttle Atlantis, during mission STS-34 on October 18, 1989. From there, its IUS booster was started and it began its unique “VEEGA”, or Venus Earth Earth Gravity Assist, maneuvers. Galileo flew by Venus on February 10, 1990 at an altitude of 16,000 km (10,000 miles). It then flew by Earth on December 8, 1990 at an altitude 960 km (597 miles). 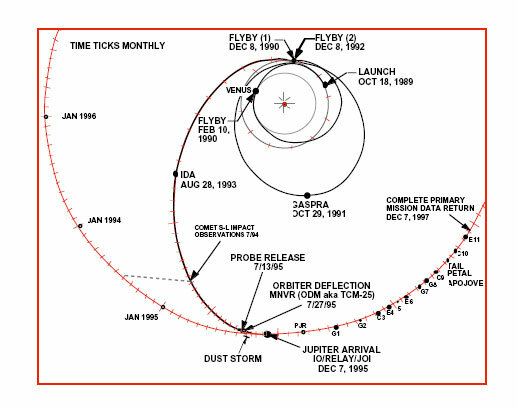 Its trajectory took it near Asteroid Gaspra on October 29, 1991, coming within 1,601 km (1,000 miles). Then it was back to another Earth fly-by on December 8, 1992, this time at an altitude of only 303 km (188 miles). On its way back towards the outer solar system it flew by Asteroid Ida on August 28, 1993, coming within 2,400 km (1,400 miles) of the asteroid. On its way to Jupiter, Galileo was positioned perfectly to observe the doomed Comet Shoemaker-Levy 9 as it impacted the planet. Pieces of the comet, having been torn into fragments by Jupiter’s immense tidal forces, impacted Jupiter from July 16 – 22, 1994, on the side facing away from Earth. Fortunately, Galileo had a prime view and was able to record the impact. Earth-based telescopes could only observe the impact sites as they rotated into view a few minutes afterwards. In July, 1995, Galileo released its atmospheric probe component. 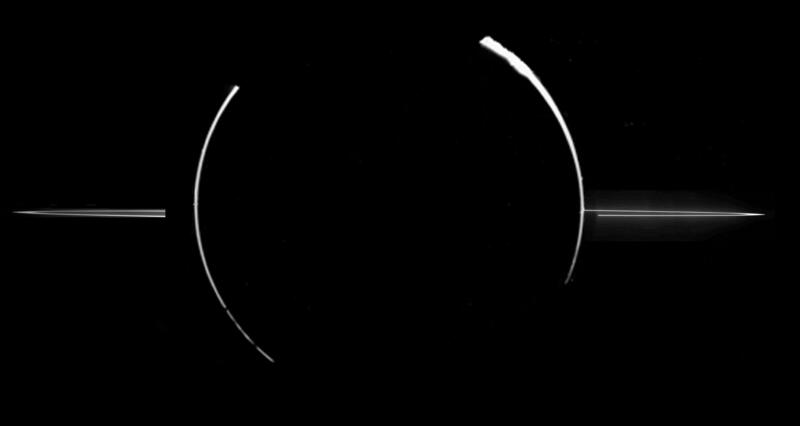 For the next five months, the probe and orbiter continued their cruise to Jupiter. On December 7, 1995, Galileo had arrived. The orbiter and probe diverged onto their separate missions. On December 7, 1995 Galileo’s atmospheric probe sliced into Jupiter’s atmosphere at 47.6 kilometers per second (106,000 miles per hour). As the atmosphere began to slow the probe, it deployed its drogue and main parachutes and dropped its heat shield to expose its scientific instruments. The probe began recording data and transmitting it up to the main Galileo spacecraft orbiting high above, which then re-transmitted the data to Earth. The probe recorded 58 minutes of data on Jupiter’s weather and atmosphere. Towards the end of its descent, the probe measured wind speeds of 724 kilometers per hour (450 miles per hour). The intense heat and pressure of Jupiter’s atmosphere melted and vaporized the probe less than an hour into its journey through Jupiter’s atmosphere. While the atmospheric probe’s job was complete, the Galileo orbiter still had years of work left to do. The orbiter received its electric power from two radioisotope thermoelectric generators (RTGs). That may sound complicated, but it’s really quite simple. These RTGs carry the radioactive element plutonium-238. As the plutonium decays, it releases energy in the form of heat. That heat can then be easily turned into electricity through the Seebeck effect. This type of energy generation is long-lasting and reliable, as well as impervious to the cold temperatures and strong radiation fields of the Jupiter system. Galileo carried two of these RTGs, with a combined total of approximately 22.7 kilograms (50 pounds) of plutonium-238. While these radioactive components had been used on previous space missions, Galileo drew extra concern due to it being both carried by the Shuttle as well as the multiple Earth fly-bys. Anti-nuclear activists protested Galileo’s launch, fearing a malfunction could cause radiation poisoning for many thousands of people on Earth. NASA, however, argued that the probability of risk was extremely low. Galileo conducted slow orbits of Jupiter, approximately 2 months long each. The orbits were elongated, and designed to bring the spacecraft within different distances to Jupiter, which allowed it to sample different areas of the planet’s magnetosphere. These orbits were also designed to bring Galileo and its instruments into close fly-bys of Jupiter’s largest moons. Galileo completed its primary mission on December 7, 1997; however, the craft was still functioning extremely well and was able to continue taking measurements and sending valuable data back to Earth. Its mission was extended three times, operating until 2003. The late astronomer Carl Sagan devised a set of experiments to be conducted by Galileo during its first fly-by of Earth. The purpose of the experiments was to see if life could be easily detected from a spacecraft. The results of the experiments were published by Sagan in 1993, in the scientific journal Nature. The experiments were a success, as Galileo was easily able to detect what are referred to as the ‘Sagan requirements for life’. 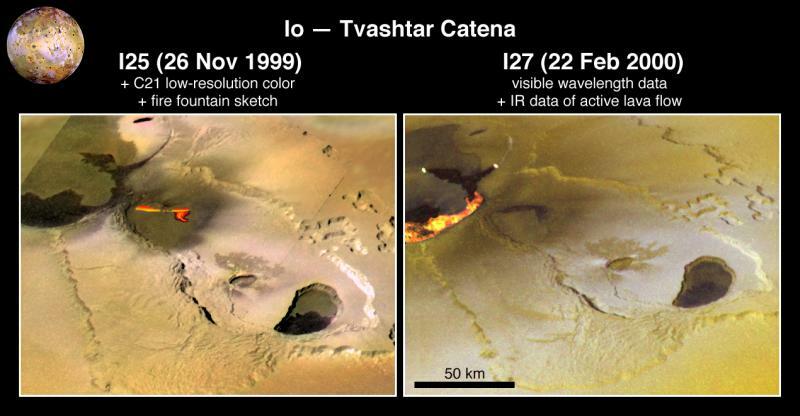 These include strong absorption of light at the red end of the spectrum (indicative of plant photosynthesis), absorption bands of molecular oxygen (again, indicative of plant life), the detection of methane in the atmosphere (a gas created by either volcanic or biological activity), and the detection of narrowband radio wave transmissions (could indicate a technologically advanced civilization). By the end of its mission, Galileo had conducted 34 orbits of Jupiter and had made multiple fly-bys of Jupiter’s moons: Io 7 times, Callisto 8 times , Ganymede 8 times, Europa 11 times, and one fly-by of Amalthea. Due in part to Galileo’s discovery of potential oceans on Europa (and possibly other Jovian moons), the decision was made to end the orbiter’s mission by sending it to the same fate as the atmospheric probe eight years prior. Rather than risk contaminating (with either Earth bacteria or radiation from the RTGs) one of Jupiter’s potentially life-harboring moons, Galileo would be ordered to impact Jupiter. On September 21, 2003, Galileo entered Jupiter’s atmosphere at 48.2 kilometers per second (108,000 mph). The total mission cost was approximately $1.4 billion USD, had more than 100 scientist partners from many different countries, and involved the work of more than 800 individuals. In spite of postponements, an antenna that failed to fully deploy, and a tape recorder malfunction, Galileo performed magnificently. It was a mission that brought us up close and personal with our Solar system’s largest planet and provided us with a much more detailed understanding of the Jovian system. Galileo paved the way for future studies of Jupiter and its moons. Its successor, the Juno orbiter, is currently en route and arriving in July of 2016, and plans are being considered to investigate Europa’s oceans. Like the astronomer that the spacecraft took its name from, Galileo Galilei, this mission revealed new worlds that we previously could only distantly wonder about.